On the day before this year's National Show & Sale, the Murray Grey Beef Cattle Society organised an education day which included a fascinating morning on marketing led by Ben Simpson of OGA Creative Agency. Ben is a professional cattle photographer and a cattle breeder himself, and showed us some techniques for taking better photographs of our cows. 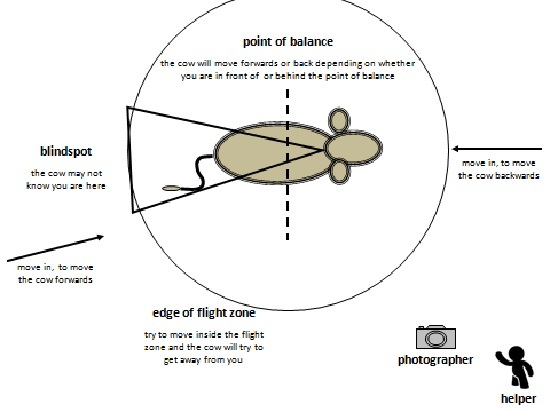 Davo and I are both very keen on using the flight zone and points of balance for calm, quiet stock handling but it was fascinating to see these principles being put into practice not so much to move cattle but to position them precisely for the perfect photo opportunity. avoid shadows on the animal's body - we found that, when taking photos at sunset we would have to re-position the animal so their head didn't cast a shadow on their shoulder. This is where full sun is a problem, also. take at least two people into the paddock for your photo session - Ben used three in his demonstration but we don't have that option and, for what we needed, we managed well with two. One person positions the animal; applying slight pressure at the front or back to move backwards or forwards and backing off quickly when the animal falls into position. get the animal's attention once it is in position - the helper needs to stand behind the photographer and slightly to one side, towards the animal's head, and do something interesting - waving a hat and making a loud "meurghh" noise worked for us. You don't want the animal to turn it's head too much so both people need to be positioned forwards of the shoulder.